What jacket would you wear during the apocalypse? The broad picture, of course, depends a lot on what kind of apocalypse you’re dealing with—Mad Max studded leather will sink you fast in a Waterworld. But the sartorial details will say a lot about who the apocalypse makes you become. In Netflix’s much-hyped new movie Bird Box, the end crash-lands as a monstrous force that kills by being seen, transforming Malorie (Sandra Bullock) into a ferocious outdoorsmom as she desperately canoes five-year-olds Boy and Girl toward their last hope of safety. She does it while wearing a blindfold and, Netflix confirms, a perfect nontechnical $60 Uniqlo puffy in mauve (officially listed as 72 Purple), which sold out before we could buy it. Though Bird Box has gotten mixed reviews, the puffy really stuck with us. 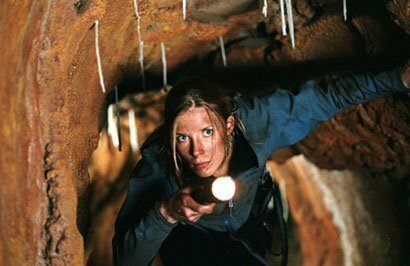 Compare it with the blue Arc’teryx shell worn by The Descent’s protagonist Sarah (Shauna Macdonald), whose adventure-athlete and cave-orc-bashing chops set a high bar for outdoorsmoms in the horror genre. Or the Eddie Bauer personal flotation device worn by The River Wild’s Gail (Meryl Streep), a former-river-guide outdoorsmom who has to raft her son down Class V rapids at gunpoint. And given that Bird Box bears a strong genre-family resemblance to The Road, it also feels fair to compare it with the Walls workwear puffy that envelops Man (Viggo Mortensen) as he doggedly safeguards his son, also named Boy. In this lineup, Malorie’s Uniqlo puffy looks a little flimsy for the task of survival. Yet she wears it with such awe-inspiring fierceness, exuding confident precision as she navigates the water and the woods, that you find yourself thinking, Surely a Patagonia label will eventually slide into view. But that would have ruined the point of the outfit. Malorie didn’t go into this thing as a technical-puffy-wearing outdoorsperson; she went into it as a reluctant mother-to-be, draped in vintage-inspired fur-collared teal wool. And after things go sideways, she doesn’t get to have niceties like a looting spree at REI, because the apocalypse takes everything, hope by hope, until all that’s left is Boy and Girl. And that hones her into a brutally determined guardian who doesn’t hesitate to blindly hurl a rowboat down rapids because that’s the only choice left. Like all outdoorsmoms, Malorie works with what she’s got: in this case a mauve Uniqlo puffy, as aggressively basic as she is aggressively consumed by survival. And she owns the hell out of it.